If your order weighs less than 13 ounces, save huge on shipping with USPS first class (with tracking number). This product weighs 6.1 oz. 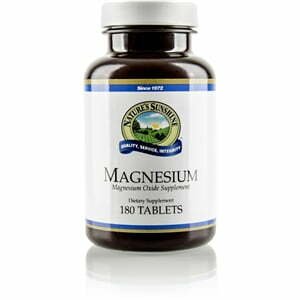 Nature’s Sunshine Magnesium provides nervous system support and assists in a variety of bodily functions. Used by several hundred enzymes in their daily tasks, magnesium is found in the bones, soft tissues, and blood. It helps metabolize various nutrients such as vitamin C, phosphorus, potassium, and sodium. Calcium and magnesium are nutritional partners and work best when taken together. 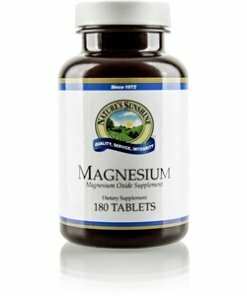 Nature’s Sunshine Magnesium comes in 250 mg capsules of magnesium oxide and magnesium amino acid chelate in a base of licorice root, kelp plant, peppermint leaves, and white willow bark. Cellulose (plant fiber), stearic acid (vegetable), magnesium silicate, Kelp plant (Ascophyllum nodosum and Laminaria digitata), Licorice root (Glycyrrhiza glabra), Peppermint leaves (Mentha piperita), and White Willow bark (Salix alba).